CR-V is back with its sights set on regaining top-selling status in Compact SUVs. Honda’s experience with All Wheel Drive and 4WD SUV vehicles in Australia has been mixed to say the least. Buoyed by the overwhelming initial success of the CR-V in 1997, Honda introduced the smaller HR-V in 1999 and then the larger MDX in 2003. 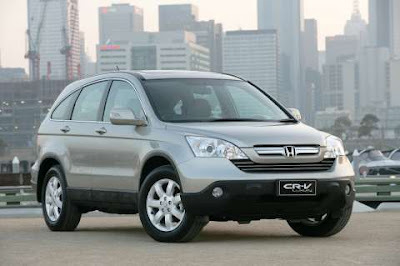 Both have since disappeared from the scene, leaving CR-V the only Honda soft-roader on the market. Whether you take the “Compact Recreational Vehicle” or “Comfortable Runabout Vehicle” definition, it seems CR-V was the right sized package for Honda buyers all along. The little HR-V was only slightly cheaper, and the MD-X about double, with neither really catching buyers’ imagination. Now in its third generation, Honda is pinning its hopes on CR-V regaining top spot in the compact SUV segment currently owned by Toyota’s now grown-up RAV4. If the critics are right, it may just happen, with the new CR-V selling almost 1000 units in its first month, a very encouraging start. Back in ’97, with little real competition, the CR-V quickly defined the compact SUV segment despite very limited credentials as a 4WD. Perhaps it was the intelligent interior layout, ease of driving and Honda build quality that set it apart and has since made it the one to catch. And catch it they did. But let’s be up-front: the CRV is not really an off-road vehicle. It’s a smooth, pleasant and polite handling SUV that will behave well in difficult conditions like wet, slippery roads and unsealed surfaces, but is not so happy in bumpy, rough terrain. Honda, by its own admission, has retained the “Real-Time” 4WD system, but tuned suspension and handling for a more sedan-like quality. Honda’s “Real Time” 4WD system is a “reactionary” one, similar to many, so-called soft-roaders. Front wheel drive almost all the time, it will activate the rear wheel drive on demand only, like slippery road conditions and dirt. Honda has instead succeeded in making the new 2.4 litre CR-V a more capable road car, which is where the vast majority of CR-Vs will spend their lives. A 20mm lower ride height and repositioned spare wheel has effectively lowered the centre of gravity almost 35mm. This seems just a small amount, but will be noticeable to anyone who has driven earlier models. Factor in the new Vehicle Stability Assist (VSA), advanced ABS and multiple airbags and you have the safest CR-V ever. Styling wise, CR-V is still in the game, with its distinctive double layer grille and a hidden spare wheel, now relocated under the rear floor. This also allows for a vertically opening tailgate, instead of the barn-door of the old model. The makeover includes an arched window treatment that looks good from outside, but does reduce rear passenger outlook slightly. The overall impression though is one of new sophistication and chic that alone may induce some owners to trade up. Survey the CR-Vs you see on the street and you’ll notice the popularity of the car with women drivers, especially those with young families. OUTthere tested our CR-V Luxury with the females and the verdict was encouraging. Typically they liked the delightful road manners, good visibility, easy parking, comfort, appointments and smart styling. Going back to my earliest recollections of Japanese cars in the early ‘70s (I learned to drive in a 1973 Civic) I recall the all-but-flawless build quality that became the hallmark of the fully imported product. 35 years later, the world is a different place and Hondas are built all over the world. Most recently, we’re getting Civics, Accords and now the CR-Vs from Thailand and they, like the rest of the world, can’t match the Japanese for absolute build quality. Our test car’s tailgate wasn’t fitted perfectly and took a bit of effort to shut. A quick test on several other identical cars showed they all worked just fine. But we’d never get this quality car in Australia for under $40k, so this is the trade-off. In summary, the new generation CR-V is a logical and intelligent revitalization to one of Honda’s most popular cars ever. Enjoyable and as easy to drive as ever, CR-V is back! Australia's Best Cars is the nation's most comprehensive and reliable consumer focused vehicle testing and award program. It was established as a joint initiative in 2000 by Australia's auto clubs, which represent almost 7 million members across the country. The 2006 Australia's Best Cars winners were announced in Sydney, December 6.